1. Remove papery outer skin from garlic (do not peel or separate cloves). Cut the top off each garlic bulb. Brush with oil. Wrap each bulb in heavy-duty foil; place on a baking sheet. Bake at 425° for 30-35 minutes or until softened. Cool for 10-15 minutes. Squeeze softened garlic into a small bowl and mash. 2. 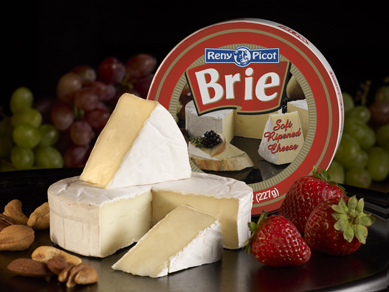 Remove rind from Brie and discard. Cut Brie into 1/4-in. slices. Place crust on a 12-in. pizza pan. Spread with garlic. Arrange cheese slices over garlic; sprinkle with almonds. Bake at 450° for 8-10 minutes or until cheese is melted.